From Roses to Rainbows: Diving into the deep end? Hi Linda - I had to do that once - and only once ... I had nightmares for a long time after ... I did resurface - obviously! It was on a walk in South Africa - about 30 of us out for a 'hike' along and down a river - with a jump into a gorge ... others did it -there was no way back ... I wasn't pushed thankfully managed to jump myself off. I would have been beyond terrified. Would have probably backtracked all the way by myself...if that were possible. Thankfully you were okay. The word crazy comes to mind. Just the thought terrifies me. I guess you did a good job raising him to be his own person. How have you been? that sounds just like me. I wouldn't do anything extreme unless my life depends on it. funny thing about humans - sometimes we do the things we fear just to remove the fear and sometimes we just can't do it. I'm pretty sure I won't be jumping off cliffs or any high places any time soon. It is just not in me to do something like that. Boring...maybe, but better safe than sorry I always say. I hear you, Linda. No bungee jumping or parachuting for this girl, either. I'm like WHY would I do this??? 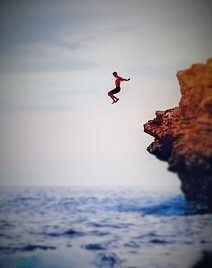 I would love to do crazy things like this in life but I don't think I ever will. I have the same fear as you if I even dare convince myself to visit a place like this I think in the end I'll chicken out.